Thank you for visiting our website and giving us the opportunity and privilege to introduce the services offered by MITCO Business Solutions. 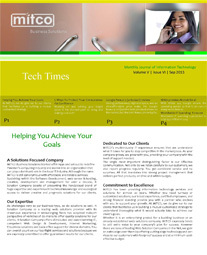 MITCO Business Solutions prides itself as one of the leaders in the management and IT consulting Industry. We have served several organizations in the past and have a good working relation with all of them, and no complaints from our clients. As a company we offer you services that are of the highest standard and extremely competitive rates. Our offerings span business and technology consulting, system integration, product engineering, custom software development, maintenance and IT infrastructure and business process outsourcing. At the heart of MITCO is the desire to embrace our differences and make connections not just down the hall or around the corner, but also across business units and around the globe. Our vision is to develop enduring relationships with clients across the globe, by providing highly professional and streamlined services at cost effective and competitive prices. Our enduring passion for the development and application of our technologies allows us to create complete solutions that make our customers more productive and successful. I have taken immense pride in assuming the duty as CEO of MITCO Business Solutions, which is a great opportunity for me to execute my responsibilities as team leader.Our mission is to develop an everlasting as well as blossoming relationship with our clientele. We ensure that it’s top of the range IT products and customized services offerings facilitate not only current but also future industrial requirements of our customers. MITCO’s success has astounded many. However, no magic formula lies behind its growth other than hard work and dedication.I am delighted to say that MITCO has achieved our main goal to be the leader in the IT industry and reach the pinnacle of the IT industry for outstanding IT infrastructure service, superior hardware and software products, and operational excellence-a proud honor for me as CEO, for my workforce, and for my country.